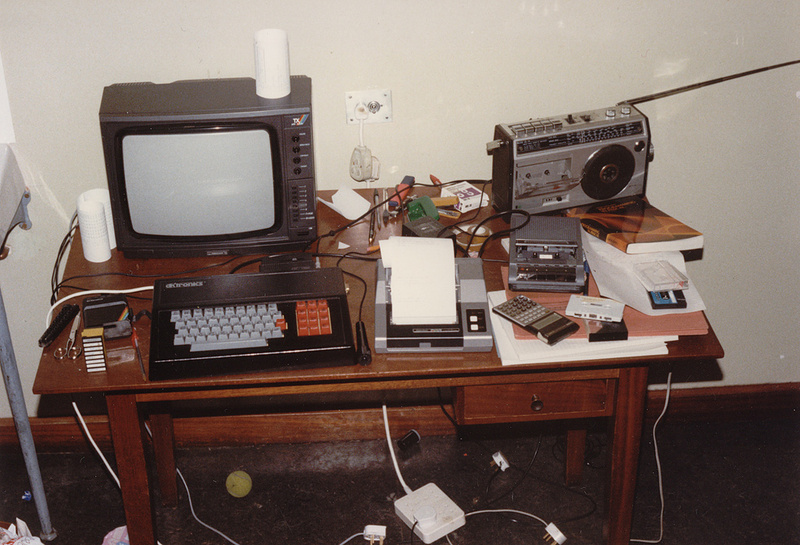 Actually I started a few years earlier, but this is probably where I really got into writing code, and writing games. That’s a Sinclair ZX-Spectrum in a dK’tronics keyboard. Microdrive on the left. TV as a monitor. Sound sampler plugged in the back, plotter on the right. Cassette player (from before I got the microdrive). I still have that pink folder under the calculator. This is all on my desk in my room at Needham Hall, from when I was at UMIST (now Manchester University). I must point out that this photo is actually a fake. Mick’s desk was never and I mean NEVER this tidy. In fact, the shot took at least half an hour to set up. BTW the blue tape on the right wasn’t a computer programme, it was Mick’s music tape. Which means it’s either, John livingston’s seagull, classic remix or Neil Diamond.